Giana’s Return aims to be a worthy unofficial sequel of “The Great Giana Sisters“. 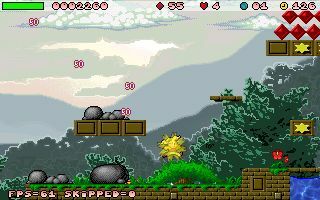 “The Great Giana Sisters” is an alltime classic Jump’N’Run game made in the late eighties mainly by Armin Gessert, Manfred Trenz and Chris Huelsbeck and gained massive attention as “Super Mario” copy, but still had it’s very own charm and fan base. * Over 18 Tracks of finest chip music!